You can use the software in this repository to set-up your Zimbra Open Source Edition server with Two Factor Authentication. 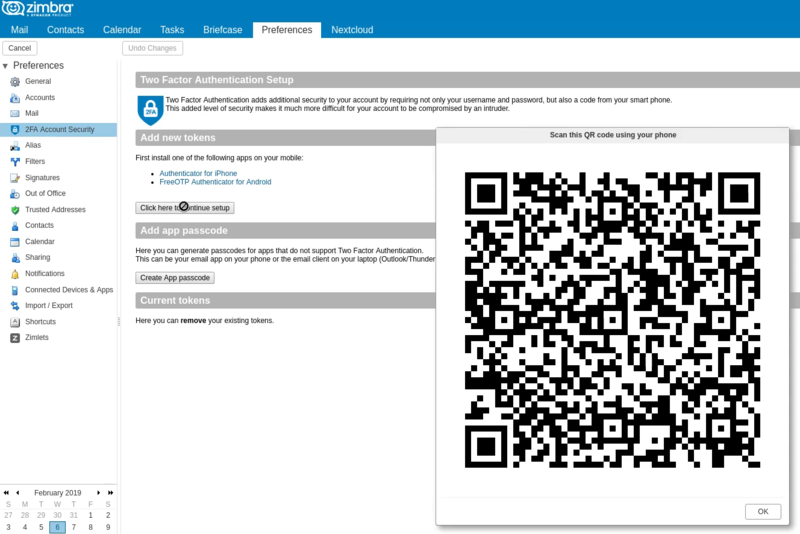 The 2FA parts are powered by PrivacyIDEA and will run in a Docker container on your Zimbra server. Technically this makes Zimbra support all 2FA tokens PrivacyIDEA supports. This includes TOTP, HOTP, and Yubikey. This project uses an LDAP Proxy provided by PrivacyIDEA. So the usernames and passwords are read by PrivacyIDEA from the Zimbra LDAP (or ActiveDirectory if you want). And the 2FA tokens are read from PrivacyIDEA database. The user can log in using 2FA by typing the username, password and token. Or just with username/password if the user has no token yet. The installation takes around 1GB of space. If you have a single server Zimbra running on CentOS or Ubuntu AND you want to use Zimbra's internal LDAP to store usernames and password you can use the automated installer. Tested on CentOS 7 and Ubuntu 16.04.4 LTS. If you have a multi-server Zimbra installation, or want to use Active Directory as back-end for your usernames/passwords. Or if you want to know all configuration steps, follow the manual install guide.